When you check out Cloud Casino, one of the very first things that you will notice is its website’s vibrant colours. Whether you access the casino on your desktop or you choose to stay mobile, the site works great on both platforms. This online casino has the leading names in online slots, including the favourites such as NetEnt, NYX Interactive, Nektan, and more. Once you have signed up for an account at Cloud Casino, you will enjoy plenty of benefits. 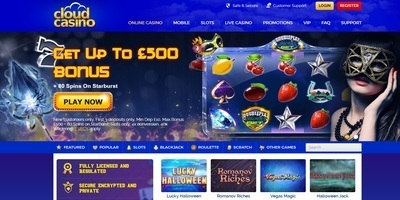 For one, the site offers promotions that the casino keeps updated on a regular basis. If you become a VIP member, you will also gain from a ton of perks exclusively for those players who are a part of the club. The brand is licenced under the jurisdictions of the UK and Gibraltar. Before proceeding, you should know that the casino is focused mainly on players in the United Kingdom. It does allow gamblers from other parts of the world as long as the local laws do not prohibit offshore gambling online. The only country that Cloud Casino prohibits is the United States. If you are looking for more reasons to be fond of Cloud Casino, you should examine the games it offers. It is home to a vast selection of slots that big-time developers have provided over the years. You can find creations of Nektan, NextGen, Nyx Interactive, and NetEnt among many others. Players can choose from 550 slots that are all playable on both mobile and desktop. Some of the most popular games on this website are Guns N’ Roses, Foxin’ Wins and most parts of the game series, King of Slots, and another hit series called Irish Eyes. The website does have limited choices when it comes to other casino games. However, you can still find roulette, blackjack, and scratch card games. You will find more than 10 live dealer games on Cloud Casino, which will surely satisfy your appetite for interactive games. Most players these days use their smartphones and tablets. It is why the casino focuses on them. They are the top priority players, which is the reason why most of the games on the website can be played using mobile devices. There is no need to download an app though, which makes it convenient not only for mobile players but also for those using their laptops or computers. The site is accessible whether you are using Android or iOS devices. Cloud Casino provides customer service from Monday to Friday, 9 AM to 12 AM. If you need to contact them, the best way to do so is through the toll-free United Kingdom phone number. Meanwhile, if you are more comfortable with writing, you can simply send your message via email to the customer support team. Unfortunately, you cannot communicate with the staff directly from your browser because the online casino does not have a live chat feature as of this moment. To ensure that all customers are safe against any kind of cyber threats, Cloud Casino utilises SSL encryption, particularly at the most sensitive areas of the website. The protected pages include the banking page, casino lobby, and registration page where you enter confidential information. With this technology, whatever you enter on these pages cannot be read by other persons or entities.